The Philadelphia Eagles have traded former NFL rushing champion LeSean McCoy to the Buffalo Bills for linebacker Kiko Alonso. The blockbuster deal reunites Eagles coach Chip Kelly with Alonso, who played four seasons under Kelly at Oregon. McCoy, 26, has blossomed in Kelly's hurry-up offense, rushing for 2,926 yards and 14 touchdowns with 80 receptions for 694 yards and two scores over the past two seasons. He led the NFL in both rushing yards and yards from scrimmage in 2013 but saw a dropoff in both categories last season. The six-year NFL veteran would have cost the Eagles close to $12 million against the salary cap in 2015. Alonso, 24, missed all of last season after having surgery to repair a torn anterior cruciate ligament suffered during an offseason workout in Oregon. The second-round draft pick led the Bills in tackles in 2013 as a rookie with 159. He had two sacks and four interceptions while starting all 16 games. 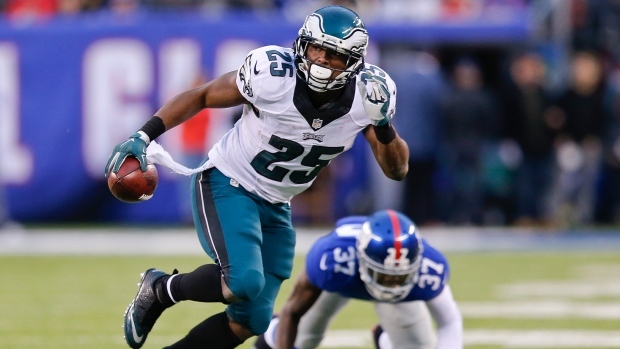 McCoy set the Eagles' all-time career rushing record during the 2014 season. He gained 6,792 yards and scored 44 touchdowns on 1,461 carries in 90 games for the franchise, averaging 4.6 yards per carry. According to numbers published by the NFL Players Association, the Eagles will carry over more than $15.7 million of unused salary cap space to next season, making their adjusted salary cap for 2015 just shy of $160 million. They trimmed more than $8 million from the payroll by releasing cornerback Cary Williams on Tuesday and will reportedly release pass rusher Trent Cole.